As the central effigy in Tankwa Town, burned at the climax of our wild week in the dust, the Clan commands the attention of our entire community. Equally, as the icon that has been used as AfrikaBurn’s identity since the event began in 2007, it stands as a uniquely South African symbol as a recognisable San figure. But where did it come from, what does it mean – and why and how did AfrikaBurn come to choose it as the icon that represents its event, and organisational, identity? Where did the San Clan come from? As you may be aware, South Africa is home to some of the greatest concentration of rock art in the world. Due to the layered nature of so many of them, the real number cannot be accurately pinned down – but their origin is not disputed. That they are the creation of the San people – South Africa’s First Nation – is known, and has been well documented since the 18th century. As far as the origin of the specific image that came to inform the design of the San Clan, that image is known to be located outside Tarkastad in the Eastern Cape Province – an area that is particularly rich in San rock art, found in the numerous sandstone caves and rock overhangs that are characteristic of the landscape of the area. Information on the image, and how researcher and longtime AfrikaBurner Greg Dunn tracked down its origins, will be made available in a forthcoming series of blogposts on the Binnekring Blog. Why does AfrikaBurn use the San Clan as its identity? Is it appropriate that the image is used by AfrikaBurn? 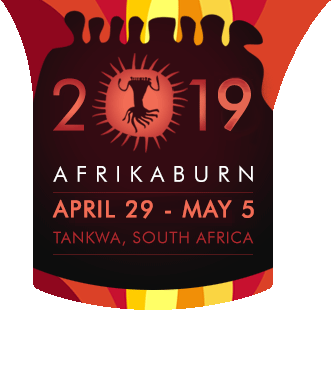 In making use of the image, even in its modified form as the icon now recognised as the AfrikaBurn San Clan, the founders of AfrikaBurn sought to obtain permission from the San community. In doing so, members of AfrikaBurn’s team sought the Khomani San’s opinion on the use of a San image for the organisation. The indication from the San elders was that they were happy for the image to be used, as its use would serve as a graphic that would raise the profile of the San people wherever it was seen. This has been echoed by consultation with Khoi/San elders that participated at AfrikaBurn 2016, including members of Khoikhoi and San elders from Kalahari, Northern Cape, Beaufort West and George, Western Cape including David Rooi and Abraham Kruiper (brother of the late San leader David Kruiper). With input from the other co-founders of AfrikaBurn, Lil Visser began the process of designing the Clan as we now know it today, in 2006. In achieving the final design, she made use of the example of the CAP’s logo (for which permission was sought from the then-head of CAP Graham Falken and other members of the now-defunct CAP) as well as the originating rock art example, the same as that sought by Greg Dunn in his research. In designing the Clan as an identity, Visser cleaned up the image in Photoshop and added two arms (which were indistinct in the original rock art image) and placed it into an encircling device with added ‘spikes’ that represented the flames associated with a burn. The final design has since been used from the first AfrikaBurn in 2007 (when it was named ‘Afrika Burns’) to date, and has been the inspiration behind all San Clan effigies held at the Tankwa event, though these are open to creative interpretation on the part of the artist, which explains why every year’s event effigy looks different. Since 2007, the San Clan has been the central effigy in Tankwa Town, much like the Man in Black Rock City. Every year, the piece is designed and built by a team of volunteers and artists – and it’s different every year as the sculpture is interpreted by that year’s appointed artist. It stands as the physical embodiment of the concept of that Clan image: our community as one. Below are past Clans, with info listed about who each year’s primary artists were, and those who assisted on the build. Design: Uys Van Der Merwe. In our first year the whole community helped to finish the structure, including Up Rize, Patrick L’Amour, Brendan Smithers, Nathan Victor Honey, and many more. Design: Paul Jorgenson, build by Brendan Smithers and the Technology.Nature.Tradition crew. Design: Egon Tania, build by he & his crew. Design & build: Nathan Victor Honey and Marco Guidetti and crew. Design & build by Nathan Victor Honey and Marisa Marques and crew. Design & build by Mike Rule and crew. Design: Brendan Smithers. Build: Technology.Nature.Tradition crew. Design & build: Brendan Smithers & Technology.Tradition crew. Design: Nathan Victor Honey. Build: Sutherland Kuns Opleidings Projek (SKOP). This year’s effigy structure, as part of the SKOP skills transfer & arts initiative was built & prepped in the Sutherland town square, then disassembled and re-erected on site. Design: Brendan Smithers, Monique Schiess (with input from Daya Heller). Build: Mike Rule & crew. Design & build: Egon Tania and Peter Forbes. Crew consisted of a wide range of volunteers including but not limited to members of the Metalheads camp and Fata Morgana crew. Design: Simon Dunckley. Build by Mike Rule & crew.